Mobile Reporting | NoteM8 by Presynct Technologies, Inc.
NoteM8 is revolutionizing the way investigators and law enforcement officers work in the field with our mobile incident reporting software. Don’t go on patrol without it! NoteM8, created by Presynct Technologies, is specifically designed for iOS & Android devices for mobile incident reporting. When field work requires an affordable ruggedized mobile computer with pre-installed software, your can't go wrong with the Honeywell-CT50 appware solution (bundle NoteM8-001). With NoteM8, you dictate instead of type your reports. Working together with Presynct_OnDemand in the Enterprise edition, NoteM8 efficiently collects, organizes, processes, completes, shares, analyzes, archives, and moves more data in less time and with minimal human effort --a complete investigative reporting software. Integrates with your other systems. And it’s all paperless and amazingly affordable! For iOS and Android Devices / Dictate Your Report! 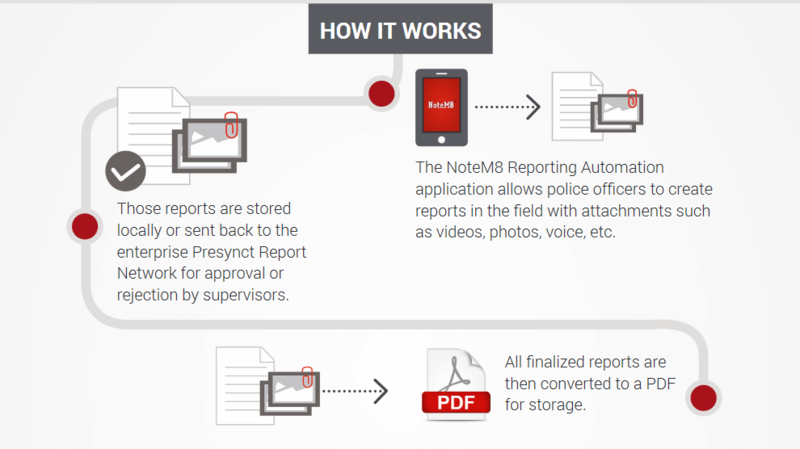 The NoteM8 Report Automation application allows police officers to use mobile incident reporting in the field with attachments such as videos, photos, voice, etc. Those reports are stored locally or sent back to the enterprise Presynct Report Network for approval or rejection by supervisors. All finalized reports are then converted to a PDF for storage.